Gold Silver Ratio - (n) theoretically how much silver it takes to purchase an equivalent weight in gold (i.e. although in practical reality today, it is merely the gold spot price divided by the silver spot price). Investors use the fluctuating gold silver ratio to evaluate the relative value of silver vs gold and possibly decide the optimal timing to buy one or the other precious metal. In late winter and the early spring of the year of writing this in 2018 AD, the gold silver ratio has again surpassed 80. You can find the current Gold Silver Ratio here. 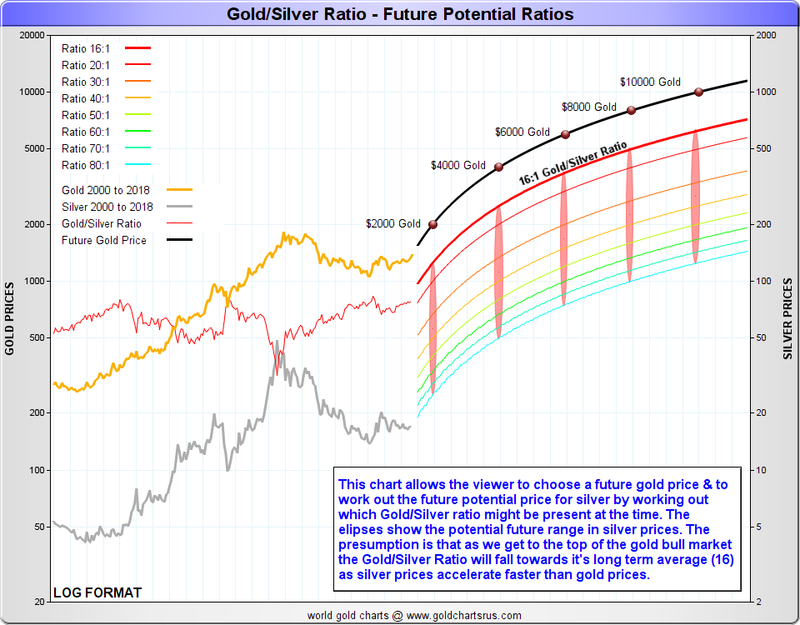 The following chart has possible projections for future gold silver ratios moving into the 2020s. Many bullion buyers fully expect gold and silver bullion to continue their 21st Century Bull Markets and possibly reach five and triple digit US dollar values per troy ounce respectively. 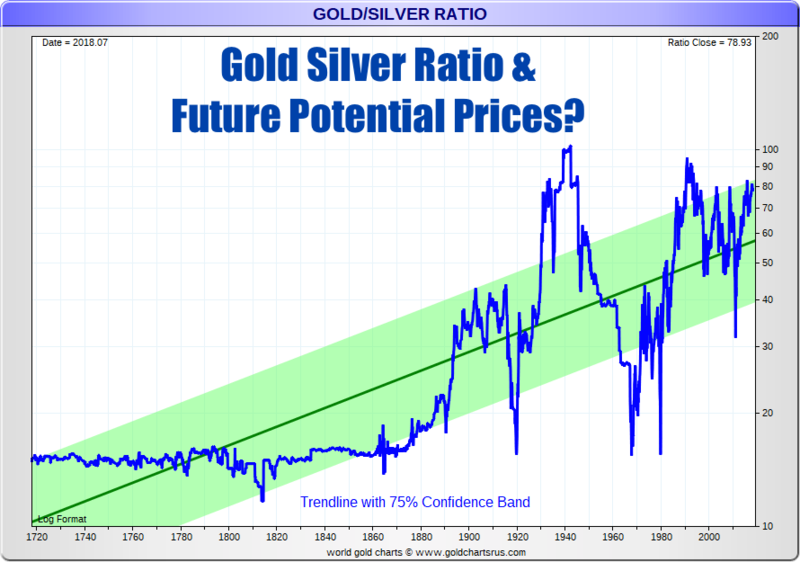 Below is a standard Gold Silver Ratio Future Potential Price Projection chart. Based on this chart one can see that with $4,000 oz USD gold spot price and a halved gold silver ratio of 40 the theoretical spot price for silver would be $100 oz USD. Of course there are much higher future gold price predictions based on historical US dollar monetary base outstanding precedent. If for example the spot price of gold were to hit $10,000 oz USD and the gold silver ratio tightened to its multi-millenia and naturally occuring in the ground averages, the world could simultaneously have silver spot price above $500 oz USD. 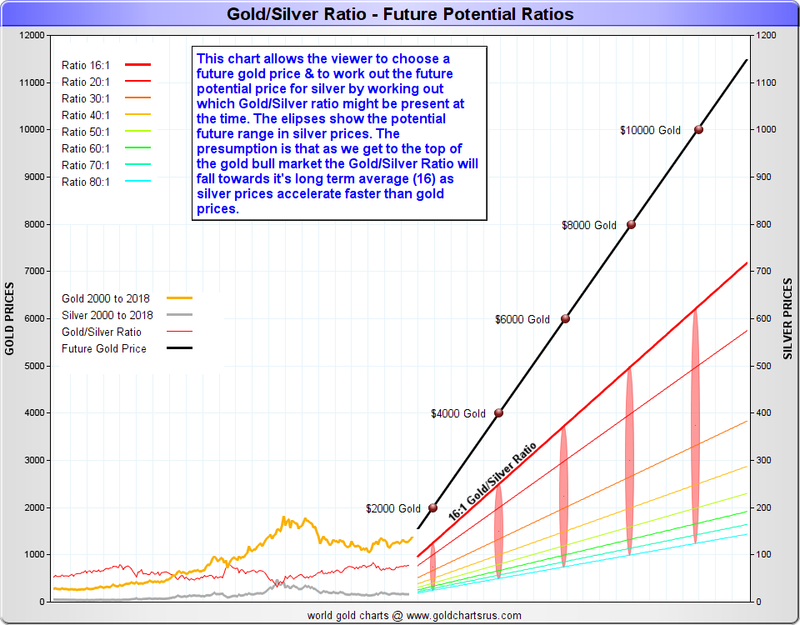 The following logarithmic format chart has possible projections for future gold silver ratios moving into the 2020s. Logarithmic scale charts are nonlinear scales often used when there is a large range of quantities like we have for various potential gold silver ratio levels. This LOG FORMAT chart below is scaled so the two equivalent percent changes are represented by the same vertical distance on the chart (e.g. $50 oz to $100 oz silver vs $100 oz to $200 oz silver both represent 100% increases thus they take up the same amount of space on the chart). You can learn more about the 5,000 year Gold Silver Ratio history by clicking here. As well, we have written about what the Gold Silver Ratio is in general and how gold and silver bullion buyers and investors use it when buying their bullion.